Originally published by City Plaza. There are other ways you can measure what’s been happening here over the past 18 months; with the 385,000 warm meals served by the kitchen group or with the 35,000 working hours spent at security posts by the hotel’s entrance and on the balconies of the building. With the 13,560 hours of shifts at the reception desk or with the more than 32,700 rolls of toilet paper distributed by the warehouse team. It can also be counted in 156 full van-loads of fresh vegetables and meat; or in the countless hours spent cleaning the building, or in the medical center, in the hours spent teaching in the two classrooms, or in the women space and in the playground or with the 18 tons of heating oil used in the boilers and radiators. But most of what’s happened during this one and half year cannot be measured. It’s not a miracle. It is the reality of what is possible through solidarity and self-organization. It is the living reality created by the hundreds of locals, refugees and “internationals” who come from countries across Europe and the world, who’ve made City Plaza their home and created this unique experiment in communal living. 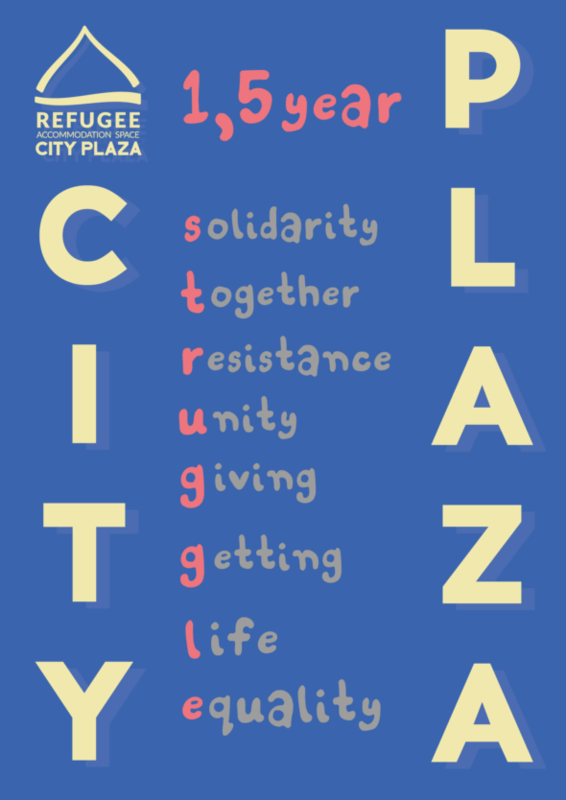 It is a reality made possible by an unprecedented show of solidarity from the ex-workers of City Plaza, who, even though they were fighting for the auction of the hotel’s infrastructure so that they could finally receive their unpaid salaries, offered it to be used by the refugees for as long as is needed. And it is also the reality created by the thousands of supporters across the globe, some of whom are known intellectuals and artists, but the vast majority of them unnamed people who’s contributions has ensured the project’s survival and created a political shield against the threats of eviction faced by City Plaza. Meeting the needs; stressing demands; reclaiming social and political rights. If crisis means the devaluation of capital, then the no longer profitable infrastructure has to be reclaimed from society in order to act against the devaluation of human life. And if EU migration and border policies are based on the selective exclusion and repression of migrants, then it is up to us, the society below, to establish and guarantee the social and political rights that others are deprived of. The re-stabilized migration regime brings new form of exclusions. After the EU-Turkey deal and the closure of the Balkan Route, numbers of border crossings decreased radically and a buffer zone was established in East Aegean. European and UN funding flowed into the institutions dealing with migration policies, and so-called experts of the EU came to organize a regime of exception from the right to asylum for the newcomers based on the “safe third country” clause for Turkey. The cooperation of the Erdogan regime in Turkey, the re-implementation of the illegal push-back practices by the Greek coast guard at the borders, as well as the horrible living conditions at hot-spots, now synonymous with suffering, repression and deaths from the cold. These are the methods implemented towards achieving the EU’s policies for controlling migration. Their policies of integration are restricted to mainland Greece, but even there the results are poor when you consider the amount of resources and the numbers of staff employed by NGO’s and the state. Even if the most inhumane refugee camps of 2016 have now been closed, the tents replaced by containers, the camps are still on the outskirts of the cities, perpetuating the refugee’s spatial and social exclusion. Their access to education, psychological support, basic public services and social networks is also inadequate. At the same time housing programs, as well as relocation and family unification procedures are painfully slow and highly selective, excluding specific nationalities and creating illegalized migrants. City Plaza is an entirely voluntary effort without any paid staff or public funding but it takes significant resources to run. Even though City Plaza’s expenses when compared to those of the official camps, are over 1/5 less, fresh food and heating oil take up a large portion of City Plaza’s budget. There are many other expenses — medicines, laundry and school materials, cleaning and hygiene products etc. Support is also important because the very real threat of eviction hangs over City Plaza. An eviction order was published by the state prosecutor in April 2017, ordering the police to carry it out but it first has to overcome the broad solidarity movement of City Plaza, and so far, the Greek government has appeared to tolerate Plaza and the other refugee’ housing squats. Nevertheless, this is more a political issue than an operational one and concerns a balance of power.